I've carried one for over twenty years - S.L. The kukri, or khukuri (in the Nepalese pronunciation) is the distinctive curved Nepali knife that is synonymous with the Gurkhas of Nepal. The kukri is respected around the world for its fearful effectiveness as a close combat weapon but it is also an humble multi-purpose tool has been using in centuries in Nepal for everyday tasks. It is the symbolic weapon of the Gurkhas throughout the world, signifying courage and valor in battlefield. It is a part of the regimental weaponry and heraldry of the Nepal Army, the Royal Gurkha Regiment of British Army, and Gurkha Rifles in Indian Army. It is known to many people simply as the ‘Gurkha knife’. Many famous knives of the world - the Bowie knife, stiletto, scimitar, Roman short sword, samurai katana and Filipino bolo - all share a role of great historical significance because of their cutting edge over other weapons, but the most famous of them all is the kukri. A Nepali boy is likely to have his own kukri at the age of five or so and necessarily becomes skillful in its use long before manhood. By the time a Gurkha joins the army, the kukri has become a chopping extension of his dominant arm. This is important because it is not the weight and edge of the weapon that make it so terrible at close quarters so much as the skilled technique of the stroke; it can claim to be almost impossible to parry. But it is important to remember that the kukri is a tool of all work; at home in the hills and on active service it will be used for cutting wood, hunting and skinning, opening tins, clearing undergrowth and any other chore, even digging holes. From this it is plain that there can be no truth in the belief that a Gurkha must draw blood every time he unsheathes his blade. t is difficult to imagine a more honorable saga in all the annals of war than the story of the Gurkha regiments of the British and Indian armies . . . I had the honor of serving with these consummate professionals in Kowloon & the New Territories, 1989 -S.L. Some western historians believe that the kukri was based on European weapons brought to Central Asia by Alexander the Great. Other researchers trace its history further back to the domestic sickle and the prehistoric bent stick used for hunting and later in hand-to-hand combat. Sir Richard Francis Burton, the famous British explorer, soldier, orientalist and spy (1821–1890), ascribes this semi-convergent origin to weapons from several regions such as the Greek kopis, the Egyptian kopsh, the Iberian falcata, the Illyrian sica, as well as the kukri. Similar instruments have existed in several forms throughout Central Asia and were used both as weapons and tools, and for sacrificial rituals. Burton writes that the British Museum housed a large kukri-like ancient Indian falchion inscribed with Pali characters. Among the oldest existing kukri are those belonging to Drabya Shah (circa 1559), housed in the National Museum of Kathmandu. The kukri came to be known to the Western world when the East India Company came into conflict with the Gurkha Empire, during the Gurkha War of 1814–1816. It gained literary attention in the 1897 novel Dracula by Irish author Bram Stoker. Despite the popular image of Dracula having a stake driven through his heart, Mina's narrative describes a climactic battle between Dracula's bodyguards and the heroes, at the conclusion of which Dracula's throat is sliced through by Jonathan Harker's kukri and his heart pierced by Quincey Morris's Bowie knife. 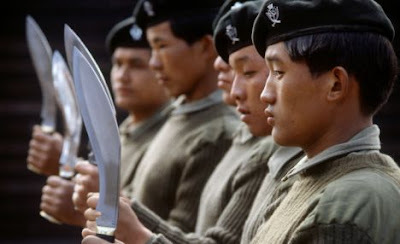 All Gurkha troops are issued with a kukri. 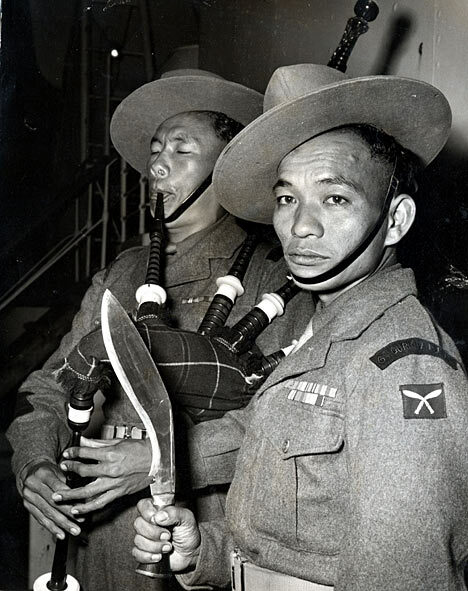 In modern times members of the Brigade of Gurkhas receive training in its use. The kukri gained fame in the Gurkha War for its effectiveness. Its continued use through both World Wars enhanced its reputation among both Allied troops and enemy forces. Its acclaim was demonstrated in North Africa by one unit's situation report: "Enemy losses: ten killed, ours nil. Ammunition expended: nil." Elsewhere during the Second World War, the kukri was purchased and used by other British, Commonwealth and US troops training in India, including the Chindits and Merrill's Marauders. The notion of the Gurkha with his kukri carried on through to the Falklands War. On September 2, 2010, Bishnu Shrestha, a retired Indian Army Gurkha soldier, alone and armed only with a kukri, defeated 40 bandits who attacked a passenger train he was on in India. He killed three of the bandits, wounded eight more and forced the rest of the band to flee. The oldest known kukri appears to be one in the arsenal museum in Kathmandu, which belonged to Raja Drabya Shah, King of Gorkha, in 1627. It is interesting to note that it is a broad, heavy blade. However it is certain that the origins of the kukri go far further back. There is one tenable story that Alexander’s horsemen carried the “Machaira”, the cavalry sword of the ancient Macedonians, in the fourth century BC on his invasion of north-west India. Its relationship with the kukri is plain. A third century sculpture, of which only a much later Greek copy exists, shows what is probably a Scythian prisoner of war lying down his arms. The weapon looks amazingly like a modern kukri. In 1767 Prithwi Naraayan Shah, King of Gorkha, invaded the Nepal valley: In September 1768 Kathmandu surrendered and Prithwi Narayan became the first King of Nepal. That his troops defeated much larger forces must be credited at least in part to their unusual weapon, the kukri. It is reasonable to suppose that this was the beginning of the universal custom of Nepalese troops carrying the kukri, a custom that spread in time to Gurkhas serving in the British and Indian Armies. Uncle Jim's unit followed a company of Gurkhas into a French village in '44. They had taken out an SS unit ... without firing a shot. There was a pile of German helmets in the town square ... they weren't empty. I've a genuine Nepalese Kukri but use my Cold Steel one for serious work. Interesting story, since no Gurkha units appear to have served in France during WW2. That is why his name is "Stretch"!!! But, but ... Uncle Jim would NEVER tell a tall tale about combat! Really, he never would. 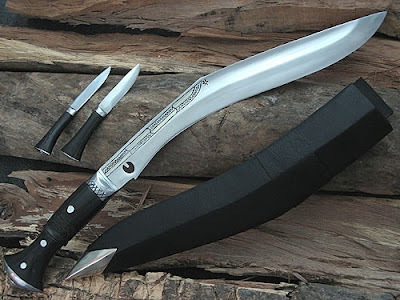 I have read a book on the Gurkha Soldiers and as part of that history the kukri was used for "beheading" on a regular basis as a tool in Nepal. Is that true or more "flare" to illustrate the determination of the Gurkha Soldier? Speak to loved ones, close friends, along with attorneys concerning the divorce lawyers they've employed. The knowledge you will get from them will help you to find the appropriate divorce attorney. Whenever a few becomes hitched they never ever assume ending up receiving a divorce. Regrettably, divorce is now increasingly more widespread in the present community, where there can be a reduced stigma attached to this. Nevertheless, it usually is an arduous and mental quest. When you have any kind of pals who may have needed to experience this particular, request an attorney's identify. My step father served with the Cameron Highlanders as part of the 4th Indian Division during the Italian Campaign. He had close contact with the Gurkhas and often expressed his respect for them. He described how the Gurkhas would send troops out on recces during the night armed with kukhris. They would creep into the German positions and feel their bootlaces. If the boots were laced in a cross pattern the kukhri would come into action. Commonwealth troops laced their boots ladder pattern which was distinctly different to the Germans. My step-father ladder laced his shoes until the day he died. Thanks for the post, people with concerned regarding safety and security must know about the guns and safety through self defense. You can also take help form the MA Gun License to get guns for defense not for killing others.